True Catholics, Francis-Bergoglio is now completely addicted to the coca leaves, which, during his jaunt to Bolivia in 2015, he admitted using. 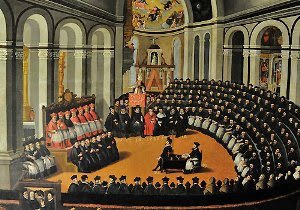 Twenty councils of the Church over two millennia decisively condemned various heresies and issued chilling anathemeta against those who denied the truths taught by Jesus Christ. Arguably, the most important role of a true pope is to ensure clarity and orthodoxy in doctrine. Otherwise, the true Faith of Christ is corrupted, people don’t know what to believe, and millions lose salvation. That is certainly what is happening under Bergoglio. And that is why a heretic pope is the worst abomination that the Catholic Church can have.